Daily walking is a chance to teach basic commands in a setting where it’s a little trickier for your dog to focus. Also, leash training is a great way to prepare your pooch for new situations and teach them not to pull you along. 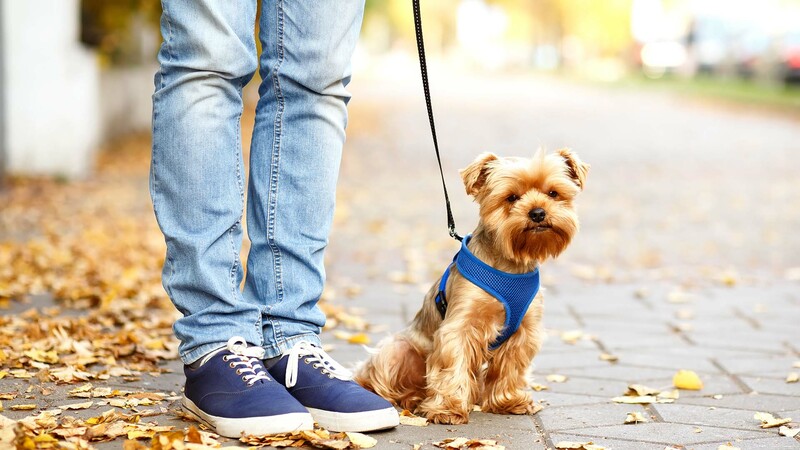 Walks are an opportunity to try and teach your dog to heel as well, which can be very beneficial if you need to travel together and you want to keep your dog close and safe. This will be an easier task too, if your dog is treat or praise motivated, so don’t forget to leave some treats for your dog walker! Daily walks are a opportunity for your dog to burn off some extra physical and mental energy. Even dogs who are active need opportunities to get exercise outdoors, in the fresh air. Dog walking gives your dog a chance to get some of the pent up energy or even normal frustration out, so he/she will behave better and be ready for bed at the appropriate time. Dogs who have excess energy are harder to train and tend to be at a higher risk for destructive behavior and boredom. Walking is also healthy for their minds and make the risk of anxiety or depression almost non-existent. For most dogs, an hour of physical activity each day is necessary and will help them lead healthy lives free of disease. Some dogs, such as working or herding breeds, need even more than an hour every day. Sedentary dogs are more likely to become overweight and unhealthy, which can cause a host of health problems, from hip and joint issues to heart disease. By keeping your dog moving, you can also improve your dog’s digestion and clear constipation. Dogs love exploring the world, and by having them walked daily, they will more than likely be open to new experiences and unfamiliar situations. Walking in different locations is a great way to keep the adventure alive for your dog, because all the new sights, sounds, and smells are interesting and FUN. If your dog is often fearful or timid, walking every day can help them get a handle on worries or fears. Also, if your dog is able to explore new situations with a dedicated dog walker supporting and protecting them, they will be more likely to experience a confidence boost and trust them more. Being a leader and protector is critical to having a healthy bond with a dog, and dog walks are a chance to grow together. All in all, walks help boost your dog’s self-confidence and strengthens their bond with another trusted human. Of course, there are lots of different games and exercises you can do with your dog, but walking is one of the absolute best exercises, because it’s an easy way to stay consistent. So, why are we such fans of walks? First of all, it’s easy to maintain a schedule with walking and once it becomes a part of an everyday routine, your dog will become accustomed to and look forward to that special time. Also, walking is easy for puppies and older dogs of any breed. It’s something you can do throughout your dog’s life without worrying about causing injuries. Jogging, for instance, is not recommended for dogs who are younger than 18 months because it can strain your dog’s joints. Dogs with flat noses may have a hard time breathing during aerobic exercise, especially when it’s hot outside. We think walking is awesome because it works for almost everyone. Although some working breeds (like border collies) are super-focused and need a “job” to be happy, most dogs just want to cut loose and spend some quality time with someone, and walks are a good way to make that happen. When it comes to hiring a dog walker that is right for your dog, it is important to first have a “Meet and Greet” to see if your dog likes the person and if you can see your dog spending time with them a few hours a week. A worthy dog walker needs to be experienced, licensed, trained, insured and most of all a DOG LOVER! It is also important for your dog to feel comfortable with their dog walker and to start off on a literal good foot. You will be confident your that your keys/codes are secure and seen only by Rachel. Guaranteed “Meet & Greet” before your first walk/visit to ensure you can provide any special instructions or information about your dog, as well as get to know Rachel. Social media friendly! Your dog will be featured on our Instagram/Facebook Page.